Q. How do I apply Rest Easy? A. Shake very well before use. Hold the Rest Easy container 12 - 18 inches from area being treated. Spray evenly and do not saturate. This product does contain essential oils and while staining is unlikely, it is recommended to test for possible staining on a small inconspicuous area on surfaces to be sprayed. A. Yes. Remove linens. 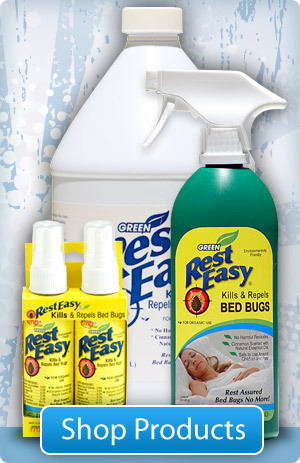 Spot treat areas on mattress that may harbor bed bugs including in and around tufts, folds and seams. Check for torn areas on bottom of box springs. Allow treated areas to completely dry before replacing linens. A. It is suggested that you spray in dresser drawers, closets, along baseboards, behind headboards and foot boards, wall hangings and other furniture that you want treated. Before treating remove any clothing from such areas. Allow about two hours for Rest Easy to dry. A. Depending on how much is sprayed and the type of surface, the scent will start to dissipate in a few hours. But some scent may remain for a few days (up to 7 days). This is important, as the cinnamon scent is one of the main components that helps repel bed bugs. Q. Can I spray where my kids and pets play? A. Yes, however please allow Rest Easy to dry before allowing anyone including children and pets to he exposed to any area sprayed with Rest Easy. Q. How long does Rest Easy take to dry? A. Please allow at least two hours to completely dry. Drying time may be effected by temperature and environment. Q. What if I'm allergic to any of the oils listed on the bottle of Rest Easy. A. This product contains plant oils which are inherently fragrant. People who are sensitive to fragrances should test a small application before using over a large area. People with severe sensitivity should contact their doctor before using Rest Easy. Please be advised that Green Rest Easy. LLC assumes no responsibility for any adverse reaction you may have. A. Sodium Laurel Sulfate is a Surfactant. It binds the oils and water together and allows them to spread out over a surface. Sodium Laurel Sulfate or like substances are found in all shampoos and hand soaps. Sodium laurel Sulfate has been known to cause some people to have dry skin. If you are not sure of this or have any specific questions, please be sure to call your doctor for further advice. A. Bed Bugs or Cimex Lectularius live 6 to 12 months. However, some can live much longer. Bed Bugs can go as long as 10 months without feeding. Female bed bugs can lay up to 12 eggs a day or several hundred in their lifetime.